Decorators appreciate the visual impact that high contrast crib bedding zebra print in black and white for the baby's room. It's eye catching, bold and funky PLUS you have your pick of color schemes including hot pink, black and white, blue or purple. Its versatility sets it apart from being just another wild animal print or jungle theme baby bedding set as you will see in the following zebra nursery pictures. Moms love how easy it is to give the black and white stripes get a makeover using the latest accent colors that will give the room a fresh, new look that is bright and modern. This theme can be very understated and feminine or bold with splashes of animal print painted on the walls or displayed in the window treatments and bedding. Our gallery of Baby Girl Nursery Pictures will help you to plan your decorating project more efficiently. You might also consider making your own crib set or having a custom bedding set made by a professional seamstress. Fabrics ranging from minky chenille to 100% organic cotton to elegant silks are available in your chosen pattern and every color of the rainbow. Zebra baby bedding also looks amazing in a jungle nursery theme where pictures of baby jungle animals might include the occasional picture of a zebra if bright colors are not in your plans. There are many bright and colorful color schemes at your disposal that you can pick from when decorating the nursery all of which will complement your crib bedding zebra print and decor. Don't be afraid to mix things up color-wise. As you can see bright yellow is as attractive as hot pink ever was in a zebra nursery theme and has the advantage of being a completely neutral color. It never hurts to experiment with a blend of patterns. Who knew that zebra stripes and chevron stripes could be so lovely together in a baby's room? 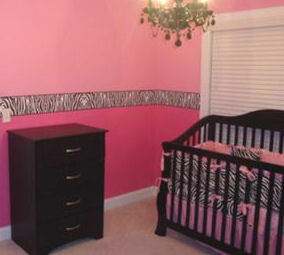 Paint the nursery walls in a hot pink paint color or add a solid pink crib sheet as a contrast to the black and white zebra print. Touches of zebra print elsewhere in the baby's room can be added via wallpaper border, artwork and decorative items displayed on shelves. Zebra print is a natural choice for a jungle theme nursery with tropical birds, monkeys and all the other wild animals found in the rainforest but some decorators prefer to brighten things up a bit. 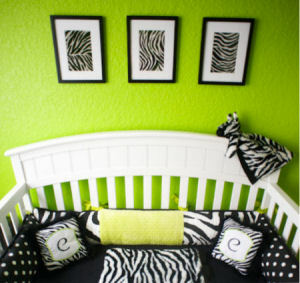 Lime green nursery walls with bright pops of color in combination with a personalized, custom zebra baby bedding set gives the room a very modern look. 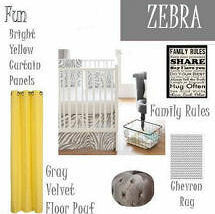 Consider covering the floor with a zebra area rug matching the crib bedding zebra print decorations and curtains. When decorating the nursery windows, curtain panels that complement the crib bedding zebra print on the nursery windows rather than compete may be best. 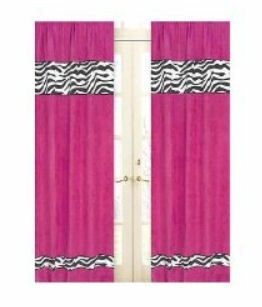 Solid color curtain panels with zebra print inserts would be better than window treatments covered in black and white stripes. Another choice would be rattan blinds or a raffia valance that won't compete with the crib bedding zebra print decorations or other patterns in the room. 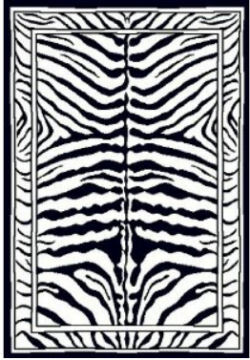 Faux zebra hide rugs or area rugs in any shape or size are available. Add a solid border to a round, square or rectangle shape rug in your accent color to give the zebra rug a custom look. Please recommend Unique Baby Gear Ideas to your friends who are looking for zebra nursery ideas. We invite you to visit often to see the latest pictures and information on decorating your baby's nursery in nursery themes where zebra print would be appropriate. 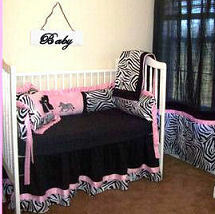 Do you have a great set of zebra baby bedding or a picture of a nursery that you decorated with zebra print? Share it!